While Western PlayStation 4 owners await the January 30 release of Dissidia Final Fantasy NT, Square Enix prepares a smaller helping of fantasy fighting with Dissidia Final Fantasy Opera Omnia, featuring much smaller, more adorable versions of fan-favorite characters teaming up for turn-based battles. A free-to-play offshoot of the Team Ninja-developed fighting game, Opera Omnia sounds like a game created to appeal to Final Fantasy fans who love to see their beloved characters team up but can’t quite get a handle on Dissidia’s odd fighting system. 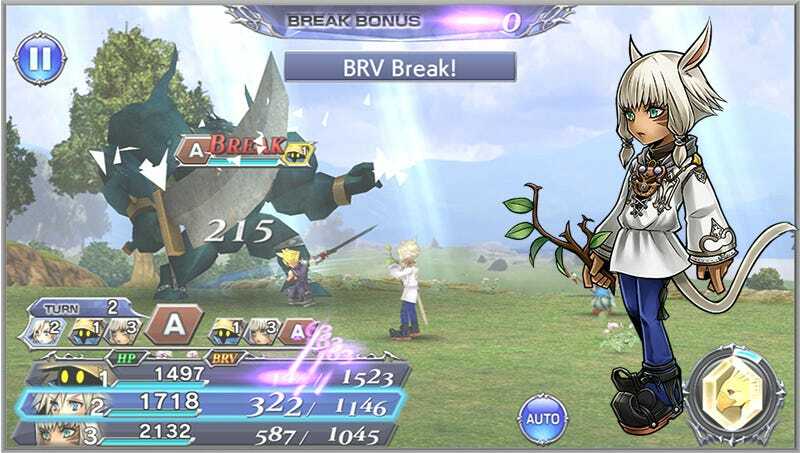 Rather than real-time battles, the mobile game features a take on the traditional turn-based battle system, with players defending to build up bravery before unleashing powerful attacks. It’s the art style that’s got me jazzed about Dissidia Final Fantasy Opera Omnia. Characters like Vivi, Sahz and Tifa have seldom looked as cute as they do in this game. Check out the gallery below for a look more character and summons art. Great-looking characters is important, as Opera Omnia looks to be a free-to-play character collecting sort of game. Players can pre-register for the game via Google Play or follow it on Facebook in order to score bonus in-game currency when the game launches. So yeah, it’s going to be one of those, but at least it’ll be a pretty one of those. Dissidia Final Fantasy Opera Omnia launches later this winter for iOS and Android.